Inspired by Musical Director Elizabeth MacIsaac’s love of Medieval music, Ensemble Laude has been singing Ancient Music since 1996. 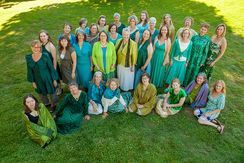 The award-winning women’s choir seeks to delight and inspire audiences through its intimate sound and exquisite sonorities. While recently it has added newer music to its repertoire, commissioning new works from Canadian composers, it continues to focus on music that is of a modal nature, or medieval in theme. The choir sees its strength as the presentation of delicate transparent pieces, music that transforms.